In case you haven’t heard, Pantone named the ‘living coral’ as 2019’s color of the year. It’s characterized by a pinkish-orange hue that’s said to reflect “warmth, nourishment, and shelter of coral reefs to sea life”. But here’s a bigger news: Our country’s coral reef situation has gotten from bad to worse—and it’s not getting pretty. While Pantone’s announcement aims to bring our attention to the world’s diminishing coral reefs, it’s time that we finally talk about it—starting with our own territories. The Philippines is considered as one of the world’s centers for marine biodiversity, meaning that our country is home to hundreds of coral species and thousands of fish species. But what do corals have to do with you? The Sumilon Marine Sanctuary in Cebu is the first marine protected area in the Philippines and became a fish sanctuary in 1974 under Siliman University Marine Reserve. Photo courtesy of Ferdinand Edralin/Inquirer.net. Contrary to popular belief, corals aren’t rocks. They’re actually animals that are made up of hundreds to thousands of tiny soft-bodied organisms called polyps. Corals don’t only provide shelter to fishes, but they also supply them with food. Simply put, if our corals are destroyed, then our country’s fish supply is also under threat. Back in 2014, renowned marine biologist Wilfredo Licuanan was commissioned by the Department of Science and Technology to carry out an extensive nationwide reef assessment to examine the health of our coral reefs. Three years after, Licuanan and his team found out that 90 percent of our country’s reefs now range from fair or poor conditions. In contrast, the last assessment 40 years ago showed that the reefs were still in excellent condition. There are a lot of elements that contribute to these perturbing circumstances. Stressors such as overfishing, pollution, coastal developments, and climate change are just some of the factors that play a part in the destruction of our coral reefs. This May 2016 photo provided by the National Oceanic and Atmospheric Administration (NOAA) shows bleaching and some dead coral around Jarvis Island, which is part of the U.S. Pacific Remote Marine National Monument. Photo courtesy of Bernardo Vargas-Angel/NOAA via AP. 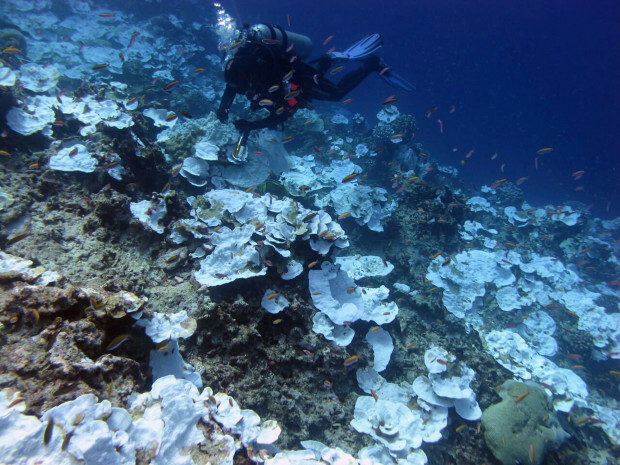 For one, climate change is responsible for a phenomenon called coral bleaching. Warmer waters and depleting oxygen levels compel coral polyps to expel algae living inside their tissues. This causes the corals to turn into a whitish color, making them more vulnerable to death. 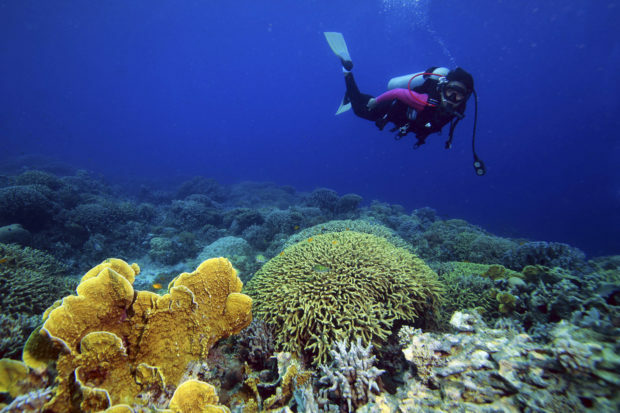 Coral bleaching is a serious issue that is prevalent in both local and international waters, but Licuanan said that 80 percent of coral mortality is caused by human activity, rather than natural calamities. Plastics also largely contribute to declining coral health. The Philippines alone is the third largest contributor of plastic waste in the world—a majority of which end up in the ocean. Of course, world leaders can’t simply turn a blind eye to this. This is why they came up with solutions to keep the situation from getting worse, but this doesn’t mean that we should already be complacent with the remedies presented to us. One of which is coral gardening, characterized by removing a coral fragment from a reef before being raised in nurseries. Once they mature, they are installed at the restoration site. Now, this may also not be the best solution as well because they further inflict harm to existing coral sites. “Reefs do not form overnight. They take thousands of years to develop,” Licuanan said. He also added that our coral reef crisis cannot be solved by coral gardening because it is expensive and impractical. I first learned about the implications of our diminishing corals back when I was still in university. In fact, this was the very reason that got me into the whole anti-plastic movement. It’s a cause that has resonated with me ever since and I’d like to share some takeaways that I learned back then. I’ve had the pleasure of working with Reef Check Philippines, an NGO that advocates for coral reef conservation. Their ecodiver training program teaches licensed divers the proper techniques of monitoring coral reefs. The data gathered will then be added to their worldwide database of past coral reef research. Another NGO dedicated to coral reef preservation through means of mapping out coral bleaching sites is Philippine Coral Bleaching Watch. If ever you come across a bleached coral while you’re underwater, take a photo or video of it and send it to them. Your reports will be passed on to the Department of Environment and Natural Resources for immediate action, and will be used by coral scientists around the country to advance the research on climate change-related reef stressors. Reef Check and the Philippine Coral Bleaching Watch are just one of the many marine-centric organizations that you can volunteer for. But for starters, the best thing to actually do is to leave the corals alone. One of the simple ways we can avoid harming corals is through proper waste disposal, most especially when we are on the beach. But this doesn’t mean that we should forget about proper waste disposal altogether. Corals are extremely sensitive creatures. Whenever you find yourselves diving or snorkeling, take extra caution by not touching or stepping on the corals. Use also reef-friendly sunblock when you’re in the water, as well (Read: Here’s a sunscreen that corals will love). Once we leave them as they are, the corals will heal themselves. And perhaps, this can only work once there is a collaborative effort to save our reefs. The government should establish more marine protected areas across the country, coupled with stricter laws that guard our corals. Once our reefs are destroyed, the rich marine life that was once associated with our country will be lost forever. Spread the word. Something as huge as saving the corals actually begins once we start talking about it more.